My friends Jenny & Ryan are nerds. They decided to have a party where we would feast on food that could have been in Game of Thrones. 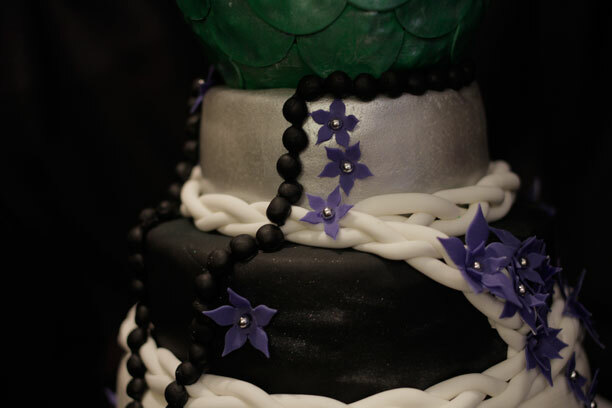 Although I’m sure fondant wouldn’t have been part of a traditional feast, I decided to make a cake for the party. Keep in mind, I have never seen Game of Thrones. After some well planned google image searches, I decided that common themes were the dragon egg and the white braid. I also finished it off with some black pearls and purple flowers just cause they’re pretty. 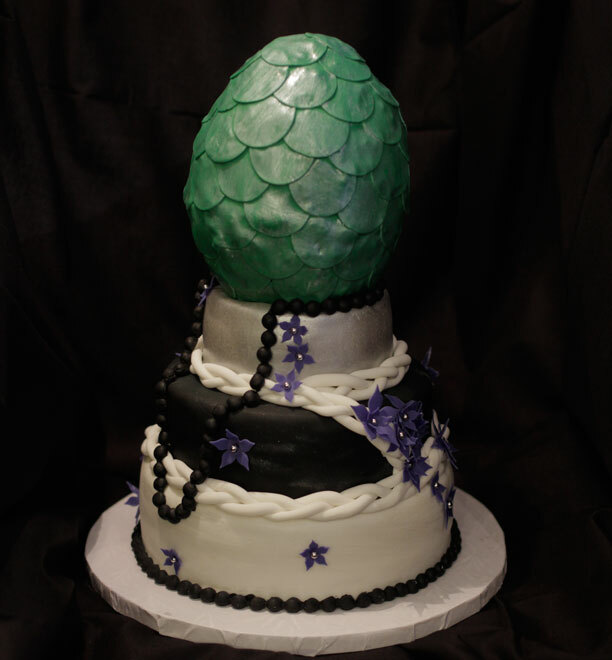 I made the dragon egg out of rice krispies and covered it with fondant “scales”. I did that by cutting circles and overlaying them from the bottom up. Then I sprayed it with some shimmer to give it an ethereal look. I also sprayed the top tier with silver airbrush paint. The problem is that this paint is thick and can clog your airbrush gun. So I decided to take it apart to clean it. Bad decision. My airbrush is still sitting in pieces on my kitchen counter. Unfortunately I had to hand paint the rest of the tiers. The cake is vanilla butter cake with fig and ginger fillings. Those fillings were delicious and I hope to use them again.